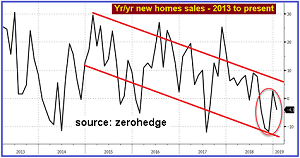 Following a rebound in November and December, January’s (delayed due to the govt shutdown) new home sales plunged 6.9% MoM despite a jump in homebuilder sentiment. This pushes year-over-year growth in new home sales back into decline. Sales of new U.S. homes in January fell to the weakest pace since October, driven by a decline in the Midwest as still-elevated prices keep buyers on the sidelines. The number of properties sold for which construction hadn’t yet started declined to 183,000, the lowest in three months, showing a weaker pipeline of building for the coming months. The sales drop occurred despite a drop in the median sales price, down 3.8% from a year earlier to $317,200. As a reminder, new-home purchases are seen as a timelier barometer of the market, as they’re calculated when contracts are signed rather than when they close, like the previously-owned homes data. This entry was posted in Housing Market and tagged New Home Sales on March 14, 2019 by Bone Fish. This entry was posted in Housing Market and tagged New Construction on March 13, 2019 by Bone Fish. CoreLogic® (NYSE: CLGX), a leading global property information, analytics and data-enabled solutions provider, today released the Home Equity Report for the fourth quarter of 2018. The report shows that U.S. homeowners with mortgages (which account for roughly 63 percent of all properties) have seen their equity increase by 8.1 percent year over year, representing a gain of nearly $678.4 billion since the fourth quarter of 2017. This entry was posted in Housing Market and tagged Home Equity on March 11, 2019 by Bone Fish.